Nearly 100 members of Old Palm Golf Club turned out recently for Seafood Night at the Club. Our chefs prepared an array of succulent seafood, all freshly cooked and beautifully presented. 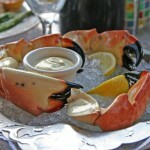 The stone crab claws were all they were cracked up to be. The jumbo shrimp were true to their name. And the oysters were perfectly chilled and served on the half shell. And that was just for starters at the raw bar. The seafood station featured 1 Â½-pound Maine lobsters, Snapper ProvenÃ§al with Brown Rice, Sauteed Sea Scallops in Lobster Sauce with Black Trumpet Mushrooms, and Middleneck Clams with Linguini and Garlic Broth. Of course, there was also plenty of sushi to go around and a variety of inspired beef and vegetable dishes at the Land Loversâ Station. Youâd hardly think there was room for dessert, but there wasâand our pastry chefs made sure everyone with a sweet tooth left happy.